February 23, 2016 10:00 A.M. 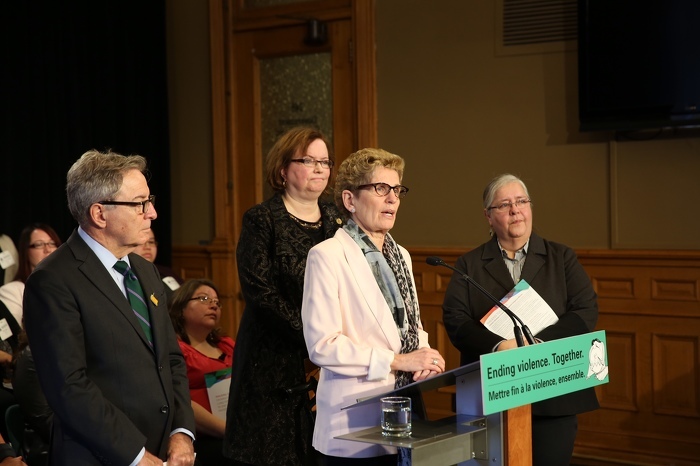 The Ontario government has released Walking Together: Ontario's Long-Term Strategy to End Violence Against Indigenous Women. The strategy outlines actions to prevent violence against Indigenous women and reduce its impact on youth, families and communities. Premier Kathleen Wynne unveiled Walking Together today at Queen's Park. The government has committed $100 million over three years in new funding to support implementation of the strategy, which it developed in collaboration with Indigenous partners of Ontario's Joint Working Group on Violence Against Aboriginal Women. The government committed to the strategy as part of It's Never Okay: An Action Plan to Stop Sexual Violence and Harassment, released last March. The new strategy builds on the existing work of Indigenous partners, community organizations and government to raise awareness of and prevent violence; provide more effective programs and community services that reflect the priorities of Indigenous leaders and communities; and improve socio-economic conditions that support healing within Indigenous communities. Improved data and research to guide the partners in developing new programs and policies that fit the needs of Indigenous communities. The strategy is one of many steps on Ontario's journey of healing and reconciliation with First Nations, Inuit and Métis peoples. It incorporates a number of the Truth and Reconciliation Commission of Canada's Calls to Action and reflects the government's commitment to work with Indigenous partners. The strategy recognizes the important role provinces play in this national conversation, which is why Ontario will continue to support the federal government's National Inquiry into Missing and Murdered Indigenous Women and Girls. Walking Together is part of Ontario's plan to provide more security, protection and opportunity for Indigenous women and communities. Indigenous partners in Ontario are leading the way on this strategy, and the Ontario government is honoured to support them on this journey. The strategy will help ensure that everyone in the province can live in safety -- free from the threat, fear or experience of violence. Indigenous women in Ontario are three times more likely to be murdered than other women. As a consequence of intergenerational trauma, Indigenous children and youth are overrepresented in child protection services. At the 2015 National Roundtable on Missing and Murdered Indigenous Women and Girls, Ontario’s delegation tabled 10 Pan-Canadian Actions to address violence against Indigenous women and girls across Canada. Later this week, Premier Wynne will join other premiers, the federal government and Indigenous leaders at the second National Roundtable on Missing and Murdered Indigenous Women and Girls, being held in Manitoba. Ontario will host the fifth National Aboriginal Women's Summit in the fall of 2016. This document was published on February 23, 2016 and is provided for archival and research purposes.